Then it was six months later. So then I said to myself, “Self, what if we just did a blog, like, one time and see how it goes from there?” And myself agreed. Of course it’s been an adjustment to “own” my home (we all know that home ownership is really just our mortgages owning us). But I have enjoyed it so far. And 6 months in, I haven’t minded the work I’ve decided to do, or rather had to do in some cases. So here are a few things I’ve learned since buying a home. Lightbulbs have different colors–I’m not sure how I made it to 32 without noticing that there are different colors of lightbulbs. I mean, really, what are the chances that I could buy lightbulbs for years and not know that there’s soft white and daylight and just randomly get the same color every time? I figured this out because my basement has 10 or so can lights and they were emitting different colored lights. The fam bam informed me that I should choose which one I liked. Like…there are different types? So I switched the basement to all soft white LEDs. I left the family room upstairs in daylight for about a month to see which I liked better. Many people (apparently) are switching to daylight because it does give a different feel and brightness than the yellow-y tinge of soft white. However, I found daylight bulbs to be super harsh on my eyes and switched all the upstairs to soft white. Toilet Paper Holders are strangely satisfying to install–None of the bathrooms had toilet paper holders. One had one of those little stand-alone holders (not connected to the wall) but I really don’t get how to live life without a toilet paper holder. #firstworldproblems. So I installed three of them (in different bathrooms, of course). The main lesson I learned is that it is incredibly satisfying to do something by yourself (when you’re me). I don’t consider myself much of a do-it-yourself-er, but I am learning. Black Friday is a new ball game–My Black Friday shopping this year was vastly different than previous years. Before, I looked for things like good deals on clothes or a pancake griddle or rugs. This year it was all about home repair/improvement stuff. I got myself a nice Ryobi drill and saw set that I have used quite a “bit” (#drilljokes). And I got myself a Nest Thermostat E. And a bunch of stuff at my new favorite store/nemesis Home Depot. Nest Thermostats are super cool–Yes, they are worth it because they are super cool! But also because they are “smart” and adjust the temperature when you’re not home. They also tell you eco-saving temperatures to keep your house at. Since I didn’t own the home for long with the old thermostat, I can’t give an actual number on savings, but really, how can I not save money by using it? Both the power and gas companies gave me rebates and it ended up only being a $9 total cost, which should break even fairly quickly based on my app telling me when I’m saving energy. Also, I installed it myself (with my dad on the phone just for reassurance), so I am pretty proud of that. One thing will always lead to another–My front door had a little safety latch on it. But most people are not used to those, and repeatedly, the door kept getting pulled open when the latch was on. Each time, it kept pulling on the molding just a little bit more. As it got pulled hard one night, I could see that it was going to rip that molding off soon, so I put it on my list of things to take down. But it just so happened that my mum was over the next day because I couldn’t get work off to be home when a guy was coming to fix a leak in the house (different story). So she pulled the door and that was the final straw. It ripped the latch and molding right off. Lesson: Do things in the exact moment you think of them. But then I got some help to pull all the molding off to replace it, and it chipped some of the sheetrock and left a hole. 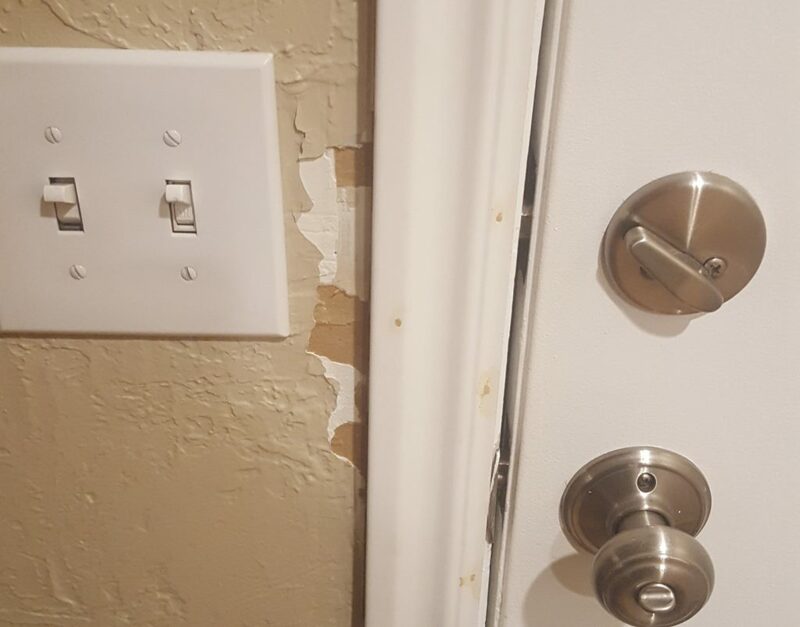 So by me not removing the safety latch when I thought about it, I ended up patching the hole in the wall, replacing the molding, painting the molding, and painting that section of the wall, which, if you look closely at it now, is not textured like the rest of the wall because I didn’t even think of that until I was done. After replacing the molding. Before patching and painting. Textured walls exist–I consider myself a hyper-observant person about life. And I notice a lot of things, but apparently not about home style/decor. I didn’t even realize my walls were textured until my sister was helping me repaint one of the bedrooms (painting over a dark brown accent wall). Suddenly, I could see that all the walls were textured. Now that I notice them, I really like my textured walls. Change your perspective, change your life. 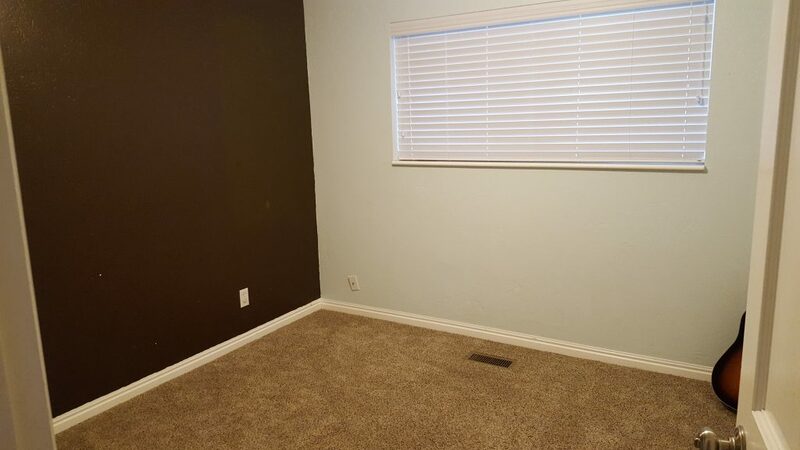 Bedroom that was baby blue with a brown accent wall. 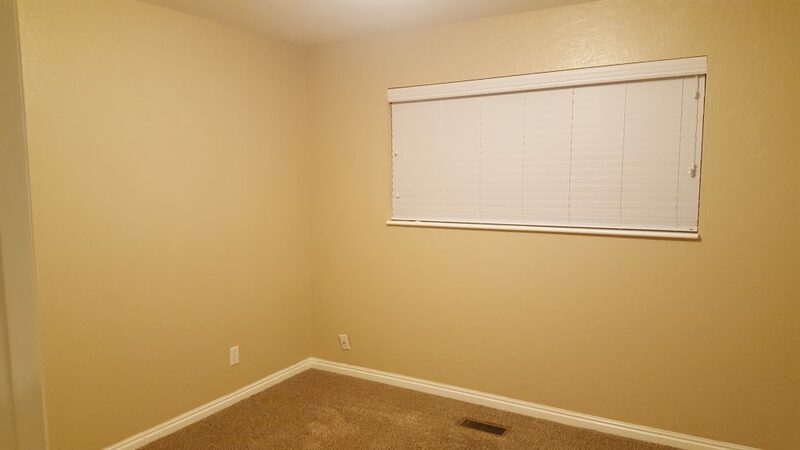 Same bedroom with a color that matches the rest of the house because, thankfully, the previous owners left a bucket of paint that was still in good shape. WD40 is a blessing–My master bath fan was a little finnicky. It was taking about a minute from turning it on to actually starting to spin. My dad said, “You can buy like a $10 or $11 replacement piece to fix that.” I said, “OK, what is that $10 or $11 replacement piece called and what would I do with it?” Instead, I just WD40’d it like crazy (also my dad’s suggestion), and it works just fine now. 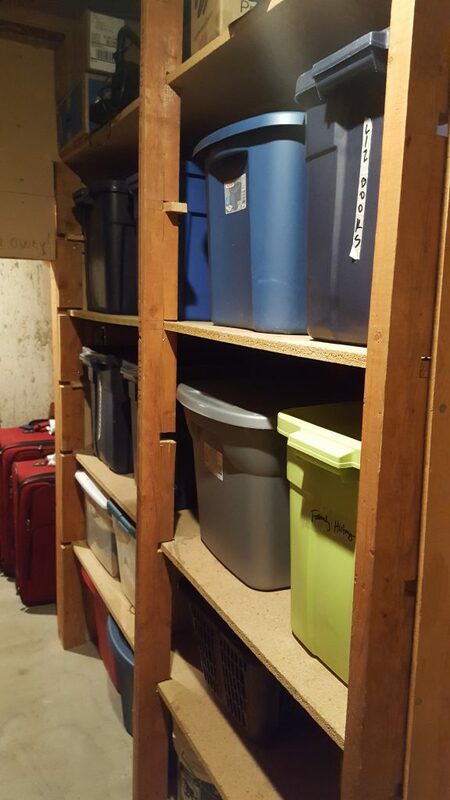 When in doubt, cut it out–The storage room in the basement has some great shelving. But most of the shelves seem to have been sized for food storage. I do have a fair amount of that as well, but I also have boxes (and boxes (and boxes)) of family history as well as decorations and things and I needed a good place for all of them. So I just took a saw to the middle shelves and now I can fit all my family history. I’d give myself more more points on the destruction skill than construction skill. 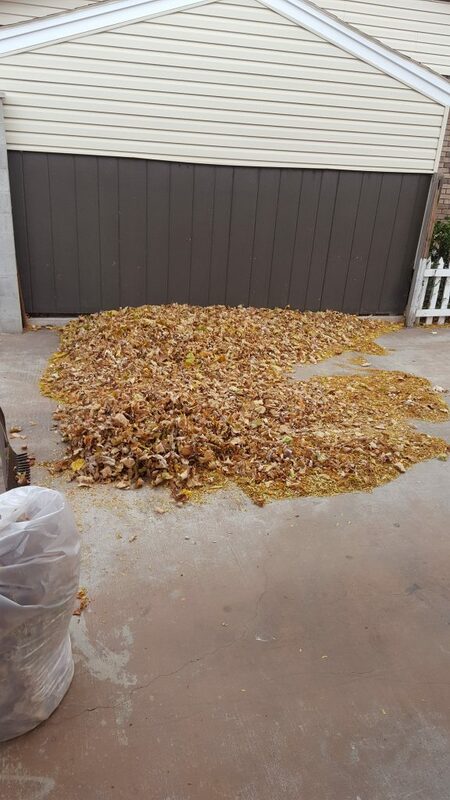 Leaves multiply and replenish–When I moved in, my neighbors told me that I have some sort of weird wind tunnel vortex that ensures all the neighbors’ leaves end up in my yard, most specifically piled in my driveway (and in the chicken coop out back–no, I don’t have chickens. Yes, I’m thinking about it). Another neighbor told me my trees drop leaves basically all year. Cool. That explained why my yard was full of leaves when I moved in in September. I grew up in a rural area with a hillside of trees in the backyard, but I never had to rake because you don’t rake mountains. You only rake when you live in a contained little box yard and your landlords don’t do it for you. Or for ward service projects when 20 people are attacking one yard. So I guess I didn’t realize what a chore it is. 18 large bags of leaves later, I was only in November. And I’ve filled my garbage a few more times since then. I count raking leaves as exercise, though, which has helped me feel better about the hours spent. Thank goodness for my powerful leaf blower, my awesome rakes, and a lawnmower. Next year, I may just pay someone. This size of pile of leaves blew into my driveway about 5 times this fall. Battery lawnmowers are cutting edge–Guess what? You can mulch leaves with a lawnmower. Anyway, I finally got a lawnmower. A co-worker recommended a battery-operated lawnmower and I thought that was a great idea since it was less maintenance on my part and they’re lighter to push. It’s also quieter, so I hope my neighbors don’t mind my early-morning lawn mowing. Switchplates have different sizes–Guys. There are different switchplate sizes in the world. And I have a switch in my kitchen that needed a new plate when I had a GFCI outlet put in. No brick and mortar store had the exact combo I needed (oversized rocker and outlet combo–I can tell you ALL about the different types of switchplates now) so I had to buy specialty online. Home warranties are a great idea–My realtor made sure I had a home warranty paid for by the sellers and it has definitely been worth it already as I’ve already had 2 leaks in the home. So grateful for that little help on keeping my costs down on those fixes. Per the usual, people are awesome–Buying a home and moving reminds you of all the people who really love you. I have the best family in the world who helped me through the process and loaded and unloaded a 17 foot U-Haul plus a few other carloads (everyone wondered how I had so much stuff as I was renting just one bedroom in a house before. I wondered, too. But I did own most of the furniture, so?) Many friends and family helped me clean and unpack and paint and provided food and especially emotional support with such a big change. I’ve learned so much from so many and I feel so extraordinarily blessed to have so many helping hands in my life. 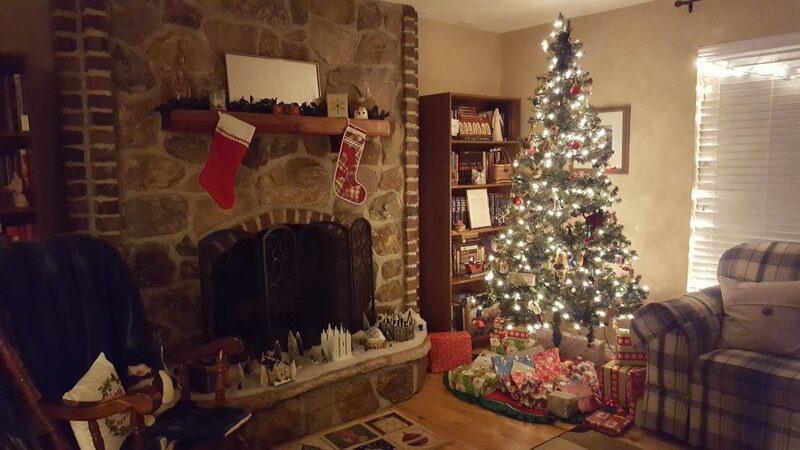 And because I love how cozy and cheerful my house was at Christmas, here’s this picture. Merry February Christmas to all (it has been snowing in Utah finally after all) and to all a good night.